Due to its size, the Biltmore Hotel was selected to serve as the headquarters hotel for the Democratic National Committee. It also housed command-posts for the campaigns of the various candidates seeking the nomination, temporary studio spaces for the television networks, and workspaces for select print journalists. Kennedy was initially dogged by suggestions from some Democratic Party elders (such as former President Harry S. Truman, who was supporting Symington) that he was too youthful and inexperienced to be president; these critics suggested that he should agree to be the running mate for another Democrat. Realizing that this was a strategy touted by his opponents to keep the public from taking him seriously, Kennedy stated frankly, "I'm not running for vice-president, I'm running for president." 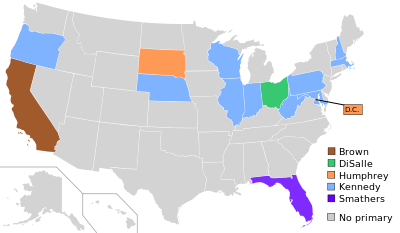 In the week before the convention opened, Kennedy received two new challengers when Lyndon B. Johnson, the powerful Senate Majority Leader from Texas, and Adlai Stevenson II, the party's nominee in 1952 and 1956, announced their candidacies. Johnson challenged Kennedy to a televised debate before a joint meeting of the Texas and Massachusetts delegations; Kennedy accepted. Most observers felt that Kennedy won the debate, and Johnson was not able to expand his delegate support beyond the South. Stevenson was popular among many liberal delegates, especially in California, but his two landslide defeats in 1952 and 1956 led party leaders to search for a "fresh face" who had a better chance of winning. Two Johnson supporters, including John B. Connally, brought up the question of Kennedy's health. Connally said that Kennedy had Addison's disease. JFK press secretary Pierre Salinger of California denied the story. A Kennedy physician, Janet Travell, released a statement that the senator's adrenal glands were functioning adequately and that he was no more susceptible to infection than anyone else. It was also denied that Kennedy was on cortisone. The Democratic platform in 1960 was the longest yet. They called for a loosening of tight economic policy: "We Democrats believe that the economy can and must grow at an average rate of 5 percent annually, almost twice as fast as our annual rate since 1953...As the first step in speeding economic growth, a Democratic president will put an end to the present high-interest-rate, tight-money policy." Other planks included national defense, disarmament, civil rights, immigration, foreign aid, the economy, labor and tax reform. Senator Sam Ervin of North Carolina attempted to soften the party's plank on civil rights. A speech by Hawaii delegate Patsy Mink persuaded two-thirds of the party to keep their progressive stance on the issue. 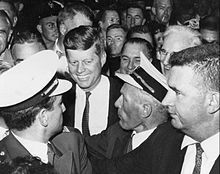 Kennedy arrives at the convention after being named the Democratic party's presidential candidate, July 13, 1960. Kennedy was the first senator since 1920 to be nominated for the presidency by either the Democrats or the Republicans. 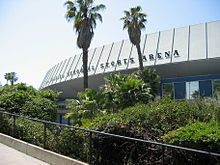 On the last day of the convention, Kennedy delivered his acceptance speech from the adjacent Los Angeles Memorial Coliseum. In Kennedy's acceptance speech he spoke about how Americans may be hesitant about him, because of his faith. In his speech he said, "I am fully aware of the fact that the Democratic party, by nominating someone of my faith, has taken on what many regard as a new and hazardous risk." He goes on to breakdown the hesitance some may have about his Catholic faith, "And you have, at the same time, placed your confidence in me, and my ability to render a free, fair, judgment...and to reject any kind of religious pressure or obligation that might directly or indirectly interfere with my conduct of the Presidency in the national interest." After Kennedy secured the Democratic nomination, he asked Johnson to be his running mate, a move that surprised many, and for several decades, there was much debate about why it was offered to Johnson and why he had accepted. Some speculated that it was a courtesy move for Johnson, who was the Senate Majority Leader, and that Kennedy was surprised when Johnson accepted; Kennedy had preferred Stuart Symington of Missouri or Henry "Scoop" Jackson of Washington as his running mate. A related story is that after Johnson accepted the offer, Robert Kennedy went to Johnson's hotel suite to dissuade Johnson from becoming the vice-presidential nominee. Johnson was offended that "JFK's kid brother" would brashly urge him to stay off the ticket. In response to his blunt confrontation with Robert Kennedy, Johnson called JFK to confirm that the vice-presidential nomination was his, which JFK confirmed. Milton DeWitt Brinson, a North Carolina delegate, asked Senator Sam Ervin to get down on his knees and beg Johnson if need be to convince him to take the nomination. The record shows that the North Carolina delegation was instrumental in his decision to run. Johnson and Robert Kennedy became so embittered and the episode marked the beginning of the personal and political feud that would have grave implications for the Democratic Party in the 1960s. More than a half century after the formation of the Kennedy-Johnson ticket, an admirer in 2014 still displays a campaign sticker on his vehicle in Del Rio, Texas. In 1993, Evelyn Lincoln, JFK's personal secretary (both before and during his presidency), described how the decision was made in a videotaped interview. She said she was the only witness to a private meeting between John and Robert Kennedy in a suite at the Biltmore Hotel where they made the decision. She said she went in and out of the room as they spoke and, when she was in the room, she heard them say that Johnson had tried to blackmail JFK into offering him the vice presidential nomination with evidence of his womanizing provided by FBI director J. Edgar Hoover, discuss possible ways to avoid making the offer, and conclude JFK had no choice. This portion of the videotape of Lincoln's interview was included in The History Channel's documentary series The Men Who Killed Kennedy, in concluding Episode 9, "The Guilty Men", produced and aired in 2003. Kennedy announced Johnson as his choice of running-mate on the afternoon of July 14. Johnson was nominated by acclamation that evening. The Chicago Tribune reported that there were shouts of protest from the galleries against the motion to suspend the rules to nominate Johnson, and again when he was acclaimed. Johnson is recorded as receiving 100% of the vote. The convention was the setting for Norman Mailer's famous profile of Kennedy, "Superman Comes to the Supermarket," published in Esquire. ^ Oliphant, Thomas; Wilkie, Curtis (2017). Road to Camelot. Simon & Schuster. ^ "Another Race To the Finish". The News & Observer. November 2, 2008. Archived from the original on January 15, 2009. Retrieved December 3, 2015. ^ a b c "Democratic National Political Conventions 1832–2008" (PDF). Library of Congress. 2008. pp. 19–20. Archived from the original (PDF) on October 25, 2012. Retrieved January 6, 2009. ^ Frum, David (2000). How We Got Here: The '70s. New York, New York: Basic Books. p. 293. ISBN 0-465-04195-7. ^ Mink, Patsy. "undated handwritten notes for speech given in support of civil rights plank at the Democratic National Convention, Los Angeles, California, July 12, 1960". Archived from the original on January 14, 2009. Retrieved January 6, 2009. ^ Kennedy, John F. (August 1, 1960). "The Democratic National Convention Acceptance Address". Vital Speeches of the Day. 26: 610–612. ^ Nash, Knowlton (1984). History on the Run: The Trenchcoat Memoirs of a Foreign Correspondent. Toronto, Canada: McClelland & Stewart. pp. 103–104. ISBN 0-7710-6700-3. ^ Lawrence, W. H. (July 15, 1960). "Johnson is Nominated for Vice President; Kennedy Picks Him to Placate the South". New York Times. Retrieved September 11, 2016. ^ Edwards, Willard (July 15, 1961). "It's Kennedy and Johnson". Chicago Tribune. Retrieved September 11, 2016. ^ Mclellan, Dennis (July 2, 2008). "Clay Felker, 82; editor of New York magazine led New Journalism charge". Los Angeles Times. Archived from the original on December 30, 2008. Retrieved November 23, 2008. Kennedy Acceptance Speech and Analysis, C-SPAN, August 23, 2008. Video highlights of the convention: Part 1: Monday & Tuesday and Part 2: Wednesday – Friday, hosted on YouTube. This page was last edited on 19 March 2019, at 03:42 (UTC).